1949 Vittorio De Sica's landmark, post-war The Bicycle Thief (1948, It. ), was another superb example of film-making from the Italian Neo-Realism movement. In 1949, it received a Best Original Screenplay nomination (its sole, unrewarded nomination) for Cesare Zavattini, and it was honored with a Special Academy Award as the "most outstanding foreign film released in the United States during 1949" - many years before an official category was created. [The film served as the impetus for the creation of an official Oscar for Best Foreign Language Film in 1956.] And it was the 1950 Golden Globe Award winner for Best Foreign Film. De Sica's film was also noted as the first film widely-distributed without the Hays Office seal of approval (for its refusal to cut two scenes involving urination and a bordello). 1949 Paramount signed a consent decree, agreeing to separate its production and distribution activities. Loew's (owner of MGM), 20th Century Fox, and Warner Bros. were ordered to divest themselves of their theaters. 1949 The UK's (and Michael Balcon's) anti-authoritarian Ealing Studios, a British film and production company (and claimed to be the oldest continuously working film studio in the world), released Passport to Pimlico (1949), starring Margaret Rutherford. It was the first of a series of acclaimed post-war classic "Ealing comedies" - the studio's hallmark - celebrated, intelligent comedies (many of which starred Alec Guinness) including Whiskey Galore! 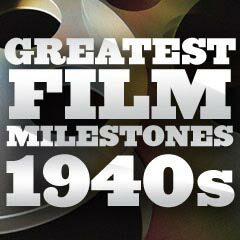 (1949), Kind Hearts and Coronets (1949), The Lavender Hill Mob (1951), The Man in the White Suit (1952), The Titfield Thunderbolt (1953), and The Ladykillers (1955). 1949 The film career of the Marx Brothers extended from 1929 to 1949. Marx Brothers Groucho, Chico and Harpo made their final film appearance as a team in Love Happy (1949), with a young 23 year-old Marilyn Monroe (in a walk-on bit role). 1949 The film debut of the comic duo of Dean Martin and Jerry Lewis was in My Friend Irma (1949). It was followed the next year by the team's only sequel, My Friend Irma Goes West (1950). The pair would go on to make a total of sixteen feature films together for Paramount, until they broke up in 1956 after their last teaming in the comedy/musical Hollywood or Bust (1956). 1949 Hopalong Cassidy, network television's first Western series, aired on NBC in June of 1949, starring William Boyd. The actor had portrayed the western hero in 66 Hopalong Cassidy films from the mid-1930s to 1948 (the first was Hop-Along Cassidy (1935)). 1949 Hollywood made one of its earliest attacks on racism with director Elia Kazan's melodrama Pinky (1949), one of the many post-war 'problem pictures'. The film was noted for using a white actress (Jeanne Crain) to portray a light-skinned black woman who fell in love with a white man. 1949 Director Nicholas Ray's debut feature film, the classic film noir They Live By Night (1949), is widely considered to have the first action scene shot from a helicopter. It was the opening scene - a tracking shot of three hardened convicts escaping from prison in a stolen car. 1949 Scandalizing herself, Ingrid Bergman became pregnant by her lover - Italian Neo-Realist film-maker Roberto Rossellini - while they were both married at the time. She had met director Rossellini on the set of Stromboli (1950, It./US) when her affair began. The child was delivered out-of-wedlock in February of 1950, three months before their marriage in May, 1950. [Bergman's husband had refused to grant her a divorce in time to make her forthcoming child with Rossellini ‘legitimate.’] The scandal began when she lied to prominent gossip columnist Hedda Hopper in June of 1949 about a rumored pregnancy. Everything erupted on December 12, 1949 when Louella Parsons 'scooped' the story regarding the pregnancy ("INGRID BERGMAN EXPECTING BABY"). Bergman was branded as "Hollywood's apostle of degradation," denounced by senators on the US Senate floor, religious leaders, and citizens' groups, and was forced to move away from the US. Eventually, the two had three children together (Renato or "Robin", and twin daughters Isabella and Isotta), and she was not vindicated until receiving the Best Actress Oscar award for Anastasia (1956), when she made a comeback and returned to Hollywood. 1949 Frequent RKO anti-hero actor Robert Mitchum was arrested of marijuana possession charges in 1948 (with American film actress Lila Leeds), and after his highly-publicized felony conviction served 43 days at a California prison farm in early 1949. [She served 60 days and was sentenced to five years probation.] Ultimately, his conviction was overturned in 1951 by the LA Court and DA when it was claimed that the arrest was part of a sting operation set-up. To capitalize on the notorious arrest, it became part of the plot of She Shoulda Said 'No'! (1949), a semi-autobiographical exploitation film distributed by the notorious marketer Kroger Babb, and starring Lila Leeds. 1949 Inspired by the work of Willis O'Brien in King Kong (1933), Ray Harryhausen animated the stop-motion gorilla in Mighty Joe Young, although the work was mostly credited to O'Brien. This was Harryhausen's first feature film for which he created stop-motion animation. His career in stop-motion animation would last until his final feature film, Clash of The Titans (1981). 1949 The first musical feature film to be shot (partially) on location (in New York City, including exterior sites such as Coney Island, the Statue of Liberty, Rockefeller Plaza, and Central Park), was MGM's On the Town, although most of the film was shot in the studio. 1949 The Rodgers and Hammerstein musical South Pacific, starring Mary Martin and Ezio Pinza, opened on Broadway on April 7, 1949. The play was based on James A. Michener's Pulitzer Prize-winning 1947 novel Tales of the South Pacific. It was adapted for the big screen and appeared nine years later as South Pacific (1958), directed by Joshua Logan and starring Mitzi Gaynor and Rossano Brazzi. 1949 50 year-old James Cagney made a comeback-return to his popular, 'tough-guy' gangster image at Warners with a dynamite, all-stops-out performance as psychotic, crooked, cold-blooded, and warped bad guy Jody Garrett in White Heat (1949). His last film with Warner Bros. was seven years earlier - Yankee Doodle Dandy (1942). This was Cagney's first gangster film role in ten years - his previous role was in The Roaring Twenties (1939) with the same director - Raoul Walsh. 1949 The first appearance of both the Road Runner and Wile E. Coyote was in the Warner Bros' cartoon Fast and Furry-ous (1949). Intended to be a one-time only appearance, their popularity called for another cartoon produced three years later, Beep, Beep (1952), and then a continuing series. 1949 Actress Judy Garland, suffering from serious personal and health issues (suicide attempts, a nervous breakdown, and heavy doses of prescription drugs) and failing to report to the set or often late, was suspended from the title role (of sharpshooter Annie Oakley) during the making of MGM's musical Annie Get Your Gun (1950) - she was replaced by Betty Hutton. It was based on the 1946 stage musical, starring Hutton opposite Howard Keel (in his film debut). 1949 The British Academy of Film and Television Arts (BAFTA) was founded in 1947 as The British Film Academy. Its first British Academy Film Awards (BAFTA) annual ceremony occurred in London on May 29, 1949, to honor films shown in the United Kingdom in the two previous years, 1947 and 1948. In the first ceremony, director Carol Reed's British film noir Odd Man Out (1947) was honored as the Best British Picture, while William Wyler's The Best Years of Our Lives (1946) was honored as the Best Picture (British or Foreign). 1949 UPA's Mr. Magoo cartoon character (aka Quincy Magoo) made his debut appearance in the theatrical short Ragtime Bear (1949). The popular character (voiced by Jim Backus) was crochety, eccentric, bumbling, semi-senile, short-sighted, resembling W.C. Fields, and forever finding himself in trouble due to his eyesight problems (and denial that there was any problem). It was the studio's first popular success, leading to numerous theatrical shorts (two shorts won the Academy Award for Best Short Subject (Cartoon) in 1954 and 1956), full-length movies (UPA's first feature length cartoon 1001 Arabian Nights (1958), and the live-action Mr. Magoo (1997) with Leslie Nielsen), TV specials (i.e., NBC-TV's Mr. Magoo's Christmas Carol (1962) - the first animated holiday special produced especially for TV), TV commercials (i.e., General Electric, Stag Beer and Sterling Optical), and three TV series (i.e, The Mr. Magoo Show, UPA's The Famous Adventures of Mr. Magoo (1964-65), and CBS-TV's half-hour Saturday morning show What's New, Mr. Magoo? (1977-79)). 1949 Director Robert Rossen's Best Picture-winning All the King's Men (1949) was a fictionalized account (based upon the Pulitzer Prize-winning and best-selling 1946 novel by Robert Penn Warren) of the rise and fall of a backwoods rebel - a story inspired by the rule (and abuse of power) of Louisiana's colorful and dictatorial state governor (1928-32) and Democratic U.S. Senator (1932-35) - the notorious Huey Pierce Long - nicknamed "The Kingfish." Mercedes McCambridge won an Academy Award (Best Supporting Actress) for her film debut - a 17-minute role in the film as conniving, tough, and unscrupulous political aide and sexually-frustrated secretary-mistress Sadie Burke. Late 40s Now that the big studios (such as Warners) were forced to divest themselves from owning lucrative theater chains, many Hollywood stars were making their last films (or were about to make their final film) under long-term contracts with the studio (i.e., Olivia de Havilland in 1946, Ida Lupino in 1947, Edward G. Robinson in 1948 (with Key Largo (1948)), Ann Sheridan and Bette Davis in 1949 (with Beyond the Forest (1949)), Humphrey Bogart in 1951 (with The Enforcer (1951)), and Errol Flynn in 1953).